(Phys.org) —As the closest planet to Earth, Venus is a relatively easy object to observe. However, many mysteries remain, not least the super-rotation of Venus' atmosphere, which enables high altitude winds to circle the planet in only four days. Now images of cloud features sent back by ESA's Venus Express orbiter have revealed that these remarkably rapid winds are becoming even faster. Similar in size to Earth, Venus has an extremely dense, carbon-dioxide-rich atmosphere and the planet's surface is completely hidden by a blanket of bland, yellowish cloud. Only at ultraviolet wavelengths (and to a lesser extent in the infrared) do striking cloud streaks and individual cells emerge, due to the presence of some unknown UV absorber in the cloud deck. By tracking the movements of these distinct cloud features, observers have been able to measure the super-hurricane-force winds that sweep around the planet at the cloud tops, some 70 km above the scorching volcanic plains. Despite decades of observation from the ground and from spacecraft, a number of mysteries remain. What causes the remarkable super-rotation of Venus' atmosphere – so called because the upper winds travel 50 times faster than the planet's rate of rotation? How do the winds vary with latitude and longitude? How much do they change over time? The answers to some of these questions are being provided by instruments on board Venus Express, such as the Venus Monitoring Camera (VMC), which have been observing the atmosphere for 10 Venus years – equivalent to 6 Earth years. The VMC acquires instantaneous snapshots of Venus at UV and near-infrared wavelengths. Simultaneous imaging in these wavebands makes it possible to detect and track cloud features, and thus derive wind data, at two different levels - approximately 70 km and 60 km above the surface. Venus Express follows a 24 hour orbit which approaches to approximately 250 km above the north pole, before moving out to a distance of 66 000 km above the south pole. This highly elliptical path provides particularly good viewing conditions for the entire southern hemisphere, while enabling higher resolution, small scale images of the northern hemisphere. These factors combined mean that VMC imagery provides, for the first time, an opportunity to study cloud level winds with high spatial and temporal resolution over a time scale of more than half a decade. 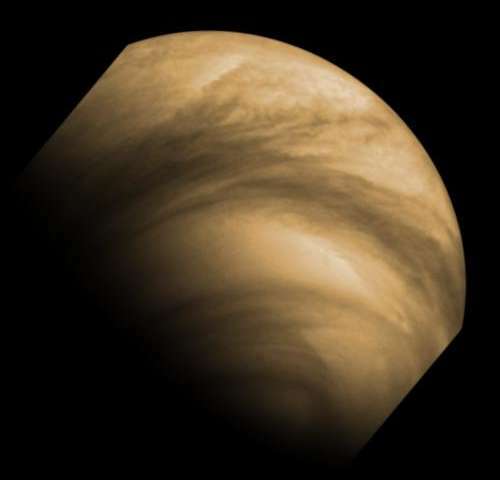 The latest analyses of Venus' cloud motions and wind speeds, based on VMC data, have been made by two independent teams - one led by a Russian group (Khatuntsev et al.) and the other by a Japanese group (Kouyama et al.). By painstakingly measuring how cloud features in VMC images move between frames, the two groups have been able to reveal new patterns in the planet's circulation. "We analysed images obtained during 127 orbits with a manual cloud tracking method, and 600 orbits with a digital correlation method," said Igor Khatuntsev from the Space Research Institute in Moscow, lead author of a paper in the journal Icarus. "Over 45 000 features were tracked by human visual comparisons, and more than 350 000 features were tracked automatically using a computer programme." The manual method of wind speed measurements consisted of tracking motions of high contrast cloud features in pairs of images taken at different times. This allowed better recognition of cloud patterns and was more reliable than the digital method in middle to high latitudes, where clouds tend to be streaky, or where contrast was low. The problem with this method is that it is very time consuming. On the other hand, the digital tracking technique was capable of streamlining image processing and producing 10 times the number of wind vectors. Both methods were in good agreement at low latitudes (below 40 degrees), but digital tracking was preferred for studying temporal variations of the mean (average) rate of flow. The Japanese-Swedish team relied solely upon their own automated cloud tracking method to derive their motion from images taken about one hour apart, at latitudes between 55°S and 70°S. A specially developed mathematical formula was used to reduce errors in the image analysis. This team's analysis is published in the Journal of Geophysical Research. The detailed analysis made it possible to establish the mean atmospheric circulation, its long-term and diurnal trends, orbit-to-orbit variations and periodicities. The zonal wind speed usually peaks at 40 - 50°S, reaching approximately 102 m/s (367 km/h) in a mid-latitude jet stream. Poleward from 50°S, zonal wind speed rapidly decreases. This means that the cloud top winds take up to five days to circle the planet's equator, but only about three days in the mid-latitudes. The mean meridional (equator to pole) wind slowly increases from zero at the equator to about 10 m/s (36 km/h) at 50°S. At higher latitudes, the meridional wind slows steadily, reaching zero close to the fast-moving eye of the global vortex located at the pole. The VMC-derived wind profiles showed significant variability from orbit to orbit. In low latitudes, variations in the mean zonal speed sometimes exceeded 25 m/s (90 km/h). This corresponded to a dramatic variation from 3.9 days to 5.3 days in the period of atmospheric rotation. The latitude of the high speed jet also varied considerably, ranging from 38°S to 57°S. Both papers also show that the wind speeds demonstrate both short term and long term oscillations. These include regular variations linked to the local time of day and the altitude of the Sun above the horizon. Other changes in wind speed were harder to explain. In some observations, the zonal wind gradually decreased from 100 - 110 m/s at the equator to less than 50 m/s in the polar regions, while in others the wind velocity was almost constant up to 40°S, with a prominent jet at 50°S. The velocity difference between consecutive orbits in the jet region could be as great as 30 m/s (over 100 km/h). Between the equator and 35°S latitude, the zonal wind velocity was found to oscillate roughly every 4.8 days, similar to the super-rotation period at the equator. This periodicity seems to be linked to waves in the upper troposphere. There is also some evidence of a much slower periodic oscillation which occurs roughly every Venusian year. "We found a peak every 238 days, but this may not be real," said Igor Khatuntsev. "It may be associated with the periods when the VMC was able to conduct observations of the planet's day side." "Our analysis of the cloud-tracked dayside velocities derived from Venus Express VMC images showed that the mean zonal velocity varied repeatedly by more than 20 m/s over a period of about 255 days," said Toru Kouyama from the Information Technology Research Institute, National Institute of Advanced Industrial Science and Technology, in Ibaraki, Japan. "These papers increase the number of questions that we need to answer about the atmospheric super-rotation of Venus, which is one of the great unexplained mysteries of the Solar System," said Håkan Svedhem, ESA's Venus Express Project Scientist. "Further investigations into the spatial structure of these wind oscillations are needed in order to explain what drives the atmospheric circulation patterns. Meanwhile, Venus Express continues to surprise us with its ongoing observations of this dynamic, changing planet." T. Kouyama et al., Long-term variation in the cloud-tracked zonal velocities at the cloud top of Venus deduced from Venus Express VMC images. In press at Journal of Geophysical Research - Planets; doi:10.1029/2011JE004013. Huh. I didn't realize there were SUVs and farting cows on Venus. This is a perfect example of a total lack of technical discussion and "bait and switch". There are numerous interesting scientific observations in this paper and some troll turns it into a discussion of global warming. Please keep this on track. I find the winds amazing and would like to know more about the driving forces (which they are investigating). There are many things that fools do not realize. Mostly however, they do not realize that they are fools. With regard to the variability of the winds on Venus, clearly it is due to gravity waves in the atmosphere where the upper layers bump into and are retarded by the lower slower moving layers. They aren't retarded nearly as much as American Tea Baggers though. Opinions are a dime a dozen, and most of them are generally wrong. Opinions are what science is here to vanquish. Perhaps you hold a different opinion. The driving force is the heat of the sun of course. The direction of motion is determined by the planet's surface rotation and the wind strength by the difference in heating between day and night sides. There must be a preferred direction of movement because non-rotation would imply that the atmosphere would simply move to and stay on the side of the planet that is in shadow as the atmosphere on the sunward side moved in every direction to the shadows. Friction with the planet's surface sets the initial bias in the direction of motion.and thermal amplification takes it from there. Rotation is the only stable solution available to the system. The Sun is very stable star, its heat flux cannot vary in large scale, or it would violate the brittle gravitational / radiative pressure equilibrium of solar plasma (the Sun would expand and explode like the supernova). The origin is increased heating of Venus itself by its own radioactivity. The increased temperature gradient makes the atmosphere of planets more turbulent. "Kepler reveals our Sun might be more variable than we imagine"
"What this means is that our Sun, which scientists have found to be a remarkably steady star with very little fluctuations in brightness over time, is that it is either a very unusual G-type star, or it happens in recent history to be going through an unusually calm period." That's good theory, ooops, Venus doesn't have that kind of geomagnetic poles to shift. Ya've measured changes in the constants on Venus? Ooops again, Venus doesn't have any of those either. He's right, the Sun is the energy source to build weather. or it would violate the brittle gravitational / radiative pressure equilibrium of solar plasma (the Sun would expand and explode like the supernova). No it will collapse (not expand) & implode (not explode) like the supernova. 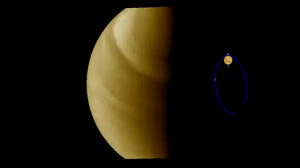 By the By: Doesn't the AWT have any effect on Venus's weather? Well - it might be, but it isn't....;-) These fluctuations are measured with high precision, but they're quite minute. Don't invent the stuffs for to support your theory - or you'll end like J.F. Prins and many other crackpots here. Q-Star..? How did you pass the parental control of your web browser? And again you claim that your mindless and evidence free speculation is a scientific theory when it is just mindless and evidence free speculation. Is it asking too much of you to learn what a theory is before you claim to have one? How did you pass the parental control of your web browser? -And, per the kepler scientists, this stability could be temporary. Similar stars show much greater variability. Uh that was a quote from scientists? You didnt even click on the link did you? So whos ignoring facts and making stuff up...? It could but it isn't - just during the global warming period the luminosity of Sun rather decreased. Don't speculate, check the hard data. So blaming mankind on global warming is a bunch of bull, made up by old deluded communists who have nothing better to do since the Berlin wall came tumbling-down! This is a perfect example of a total lack of technical discussion and "bait and switch". "Similar in size to Earth, Venus has an extremely dense, carbon-dioxide-rich atmosphere "
Does the size of Venus or its CO2 atm have anything to do with the winds? Undoubtedly yes: whole the atmosphere of Venus is formed with just a pair of giant tornadoes. The speed of atmosphere circulation at poles of Venus is about 70 km/hour, but its atmosphere is just 8x lower than the liquid water. It would correspond the permanent wind speed over 600 km/hour at the Earth. Vortices at poles of Venus. Whole atmosphere of Venus is exchanged during two days in this way.This giant circulation is powered just with the heat absorbed with atmosphere. The Japanese-Swedish team relied solely upon their own automated cloud tracking method to derive their motion from images taken about one hour apart, at latitudes between 55°S and 70°S. A specially developed mathematical formula was used to reduce errors in the image analysis. Can you really determine the speed of a river by counting the water passing you? It should. This is not a site for Children or imbeciles, which are two reasons why TeaPublicans should not be here. Undoubtedly yes: whole the atmosphere of Venus is formed with just a http://upload.wik...ion.jpg. Whole atmosphere of Venus is exchanged during two days in this way.This giant circulation is powered just with the heat absorbed with atmosphere. It probably has little to do with heat absorbed in the traditional sense, but joule heating could be a reason for the extreme temps. One must analyze the situation that includes what the conditions of the ionosphere was and the surrounding plasma environment to determine why the winds speeds increased as they were claimed to. Professor Emeritus of the Alfvén Laboratory in Sweden, Carl-Gunne Fälthammar wrote: "A reason why Birkeland currents are particularly interesting is that, in the plasma forced to carry them, they cause a number of plasma physical processes to occur (waves, instabilities, fine structure formation). These in turn lead to consequences such as acceleration of charged particles, both positive and negative, and element separation (such as preferential ejection of oxygen ions). Both of these classes of phenomena should have a general astrophysical interest far beyond that of understanding the space environment of our own Earth." And there is a source for the observed oxygen emissions. If the Republican-led House Subcommittee on Space has its way, NASA's proposed asteroid-retrieval mission will be killed, the agency's budget will be capped for the next two years at about 5 per cent less than last year's, and NASA's Earth observation efforts will be cut back by 30 percent. If posting anti-science drivel is "enjoying the internet" then RyggTard, NumenTard, ParkerTard and the others are seriously mentally ill. But then that has been obvious for some time. It could but it isn't - just during the global warming period the luminosity of Sun http://www.global...ons.png. Don't speculate, check the hard data. I cited an article about kepler scientists who measured unexpected variations of sunlike stars. They have a satellite. Do you have a satellite? They have degrees from big-name universities. Do you have such big-deal degrees? They measured these variations to significant accuracies. What have you measured lately besides the limits of your own turgidity? If our star is like the ones they observed then it may be capable of the same sort of variations. I'm not a "TeaPublican",,, why would ya think that? My politics are way left of center. And as accurate as anything posted on this page. There are no SUVs or farting cows on Venus, yet Venus is experiencing Global Climate Change™. I understand Mars has been shown to be warming as well. In truth, you understand little relating to the subjects at hand. What is the cause of the correlation between the increase in the speed of the wind on Venus and the decrease in the intelligence of American Republicans? I propose that cosmic rays are killing their brain cells, and causing the Venutians to eat beans and face east when they fart. Are you sure that a minor change in the highest altitude winds constitutes "climate change". Your earlier claims have the Earth cooling and Mars warming. What do you people in denialist land propose that Venus is doing? Reading these comments would be a lot faster & more informative if some people didn't have a compulsive need to denigrate others or to attempt to change every subject into a political debate (also centered around personal attacks). I'll be glad when they mature to about a 14 yr. level). Venus is one planet we won't be sending humans to anytime soon.